Getting in a hot car on a summer day after it has been sitting in the sun can make for a miserable first part of your drive. Struggling to open your doors and put in your bags while it’s raining is not a great way to start the day. 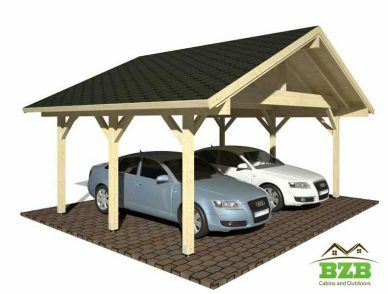 Having a carport on your property is a great way to protect your vehicle from heat, wind, rain, and snow and make your life easier. Even if you already have a garage, a carport can still be a great addition to install. Have more drivers in your house than your garage can handle? Easily add on with a carport. Perhaps you don’t have a garage and don’t have the space or means to build on. Get a carport! Our carports come with everything you will need to make a sturdy structure to protect your vehicles. It also comes with detailed instructions on how to put it together. There are also options to add on shingles and anchors. Our affordable carport can even fit up to 2 vehicles, so you and your family don’t have to fight over who gets to park there. With a 7’3” wall height, you don’t have to worry about whether your larger vehicle will fit. Our carports are designed for any kind of driver.